I don’t like Windows to keep track of programs I use often because it doesn’t really got it right. 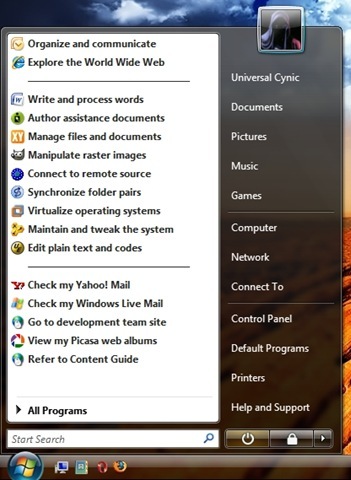 At the same time, I am not much of a fan of the Vista Start Menu when it comes to the All Programs menu. To keep programs I use often close at hand, I disabled the tracking of recent programs and pin my favorite programs to the Start Menu instead*. When I have a lot of shortcuts in the start menu, it takes longer for me to locate something because there are no separators or dividers! So, here’s a trick to creating those dividers and make your Start Menu look like the screenshot. Open Notepad (or any plain text editor) and type @exit. Then, save the file as nothing.bat anywhere in the system. Preferably somewhere you don’t access often because you won’t be using it much anyway. Take note of the .bat extension! What this batch file does is just to exit itself silently – it does nothing. Now, create a shortcut from somewhere to nothing.bat. Give the shortcut a blank icon. There are three blank icons in shell32.dll (the default icon file Windows give). Scroll a bit to the right to find it – it’s in the middle of the listed icons. Apart from the icon, also set the shortcut to start minimized. Rename the shortcut you created using the Em Dash character. If you copied from Character Map, just press Ctrl-V several times to paste it. The result is a file that looks like a line. In a standard Vista Aero look, pasting it 16 times would be just nice (and centered in the menu). Then, drag the renamed shortcut to the Vista button and wait for the Start Menu to open – don’t let go of the mouse button. Once the Start Menu shows up, keep on dragging the shortcut to between other pinned shortcuts and let go of the mouse button. There you go – a separator! To create more separators, just drag the current separator and hold the Ctrl key before letting go of the mouse button. If you want to get creative, you can also type a name on the shortcut so you’d have a line and a label. Of course, in this case, you’d need to create several ‘separator’ shortcuts and drag ’n’ drop them one by one to the Start Menu. You might be asking why do we need to create the nothing.bat file. Well, you might accidentally click the separators. The batch file we created starts minimized and exits as soon as it’s started. So, accidentally clicking on the separators won’t be disruptive as the most you’d notice is some minimal movement in your taskbar. 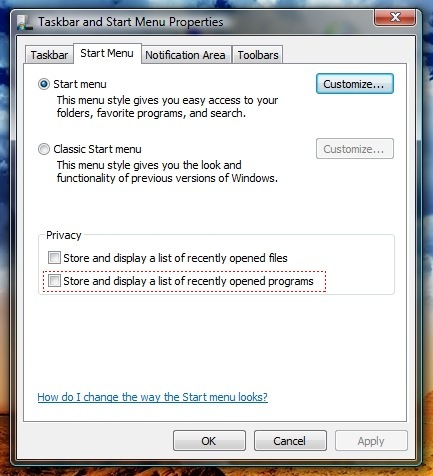 * To disable listing of recent programs, right-click a blank space on the taskbar and select Properties. In the Start Menu tab, clear the Store and display a list of recently opened programs check box. Click OK. Now you have more space to pin your favorite programs. In order to avoid original shortcuts from being renamed, I copy them to a folder to pin to the Start Menu and rename them as I please. This is *awesome*. My Start menu looks great now – thanks! Hi, thank you for this. 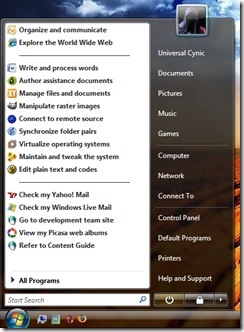 I have been irritades for a long while because of the lack of separators on the Vista start menu. This solves it for me! You’re welcome. Glad it’s useful for you too. As an update for Windows 7, you can’t copy several separators. But no problem. Just create several shortcuts to nothing.bat. In order to have the same shortcut name (the dash characters), just create them in different folders. Then, drag each of them one by one. Need more, create another folder and copy the shortcut – then drag the new one to the start menu too. To find the “em dash” character under Windows 7, open Character Map, check the box next to Advanced view and type “em dash” in the Search For box. The character will be found for you. Then, following on from a previous comment, simply create a folder called Spacer, include 5 sub-folders called Spacer 1 – 5 and copy the shortcut into each subfolder. Drag each shortcut from each subfolder onto the Start Menu where you need it and voila, you have spacers on your menu! Thanks, wickyd! That’s how I do it too. Thanks for making it clearer to readers here. Maybe I’d need to write an updated version for Windows 7.